Sprout decided to do toilet training sort of backwards. Somewhere around 33-34 months old, he started waking up with dry diapers most mornings. I didn't quite trust him enough to use underpants overnight, so we kept him in diapers, then moved to the less absorbent pullups. Though he wasn't peeing at night, at 34 months he would still occasionally leave puddles in the house during the day & I wouldn't have dreamed I could take him out in anything but pullups or a diaper. By 35 months he was independently using the toilet at home & in friends' homes (who had similar potty/toilet seat setups to ours) all the time. When out of the house he still avoided using the toilet, which sometimes resulted in accidents of the wet & also smelly variety. 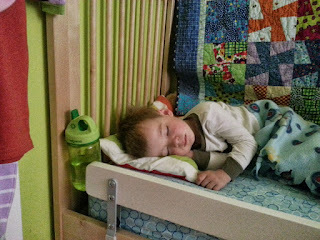 At 35 months, I realized that he'd woken up dry probably 28 of the last 30 days or so. The last pair of pullups that we had him in had become fuzzy from being worn for several nights. Probably time to make the leap to real underpants. I'd been holding off because I don't relish changing his sheets as well as his pyjamas in the middle of the night. However, I hit upon a lazy solution to the sheets issue that I thought I'd share with you, in case you're dealing with wet sheets at night too. Before putting him to bed one night, I layered ALL of his fitted sheets on his mattress, with a waterproof sheet in between each set. 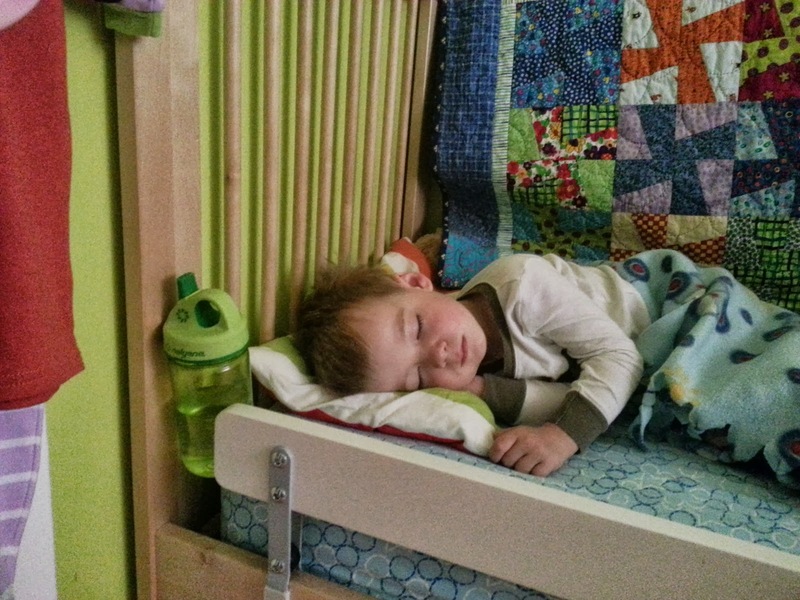 There are six sets of fitted sheets & six waterproof layers underneath him now as he sleeps. (Kind of reminds me of the Princess & the Pea) If he does wet the bed, we just have to strip off the top one & there's another dry one right underneath, ready to go. We used these Ikea mattress protectors that we'd had around since Sprout was born in between each layer. *However, if you need to buy one or more right now, please don't cross the picket lines at Ikea until the (very profitable) company comes to a fair agreement with their locked out workers. Toys R Us has similar products like this fancy one or this big one. Have you got any tips or tricks for toilet training to make accidents easier? If you tried out mine, how did it go for you? I used to do that with the kids when they were babies in cribs. Didn't I tell you? Sorry....I hated middle of the night sheet changes if there was a leaky diaper or spit-up, so I always had at least 2 sets of sheets on the cribs! It made for a whole lot of sets of sheets and pads with 2 in cribs at once though! Bahaha, here I thought I was BRILLIANT coming up with this idea! We ended up with SO MANY sheet sets. I think there are still one or two fitted sheets that aren't on the bed now, despite the six layers.